Great news! The OPSkins Premium Member subscription now includes items for PLAYERUNKNOWN’S BATTLEGROUNDS as well as CS:GO! For the same price ($5.99 per month), you can “buy down” half of your sales commission on items for these two games. As a Premium Member, your commission for PUBG and CS:GO reduces from 10% to 5%. Seller fees are calculated at purchase time. 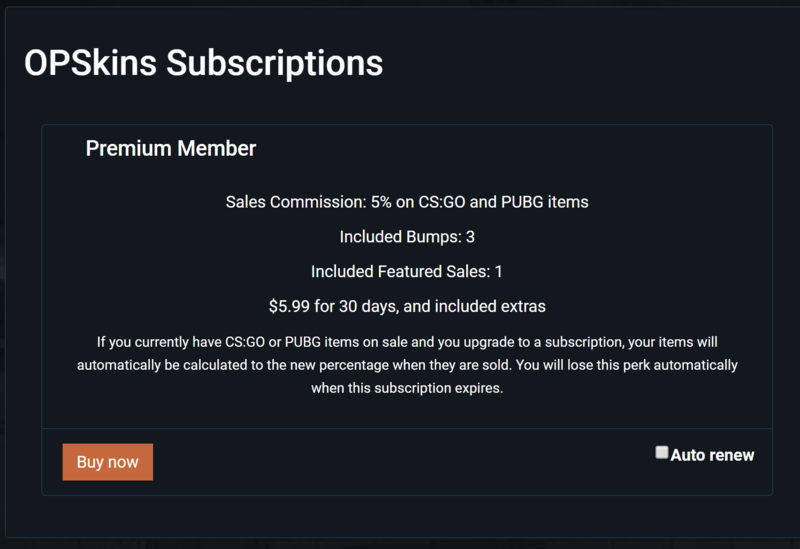 If you currently have CS:GO and/or PUBG items on sale and you upgrade to Premium, your items will automatically be calculated to the new percentage when they are sold. The same rule applies if your subscription runs out. Free Featured status does not mean you get to pick any $1000 knife on the front page each month and get it for free. “Featured” means that the $3.00 surcharge is waived when you want to “Feature” your item. Let us know what you think of this new feature! Will you become an OPSkins Premium member?